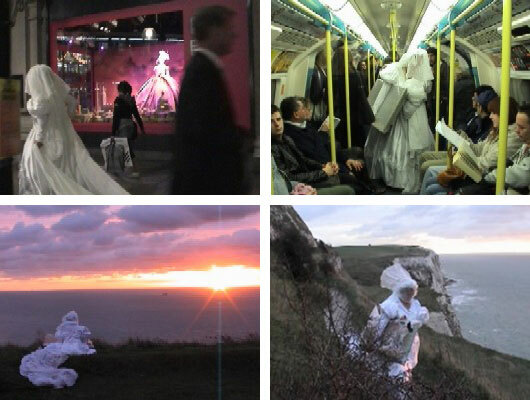 Escorting the Commuters (The woman who mistook a painting for her husband) was a performance involving a number of incidents while carrying a Francis Alys’ painting on the evening of 9th November 2005, to a night time location and returning it back again the next day. This work was created in response and as an interaction with Alys’ piece The Commuters, part of his Seven Walks project commissioned by Artangel. “A painting is hung on a wall of the entrance hall in a house situated in Portman Square, no.21. At 7:00 PM, a chosen carrier takes the painting off the wall. He brings the painting back to his home by walking or taking whatever means of transport he would normally use. The painting rests overnight at the carrier’s home. The next morning, the carrier brings the painting back to Portman Square, no21. At 11.00 AM, he hangs the painting on the wall of the entrance hall. At 7.00PM, a new carrier takes the painting off the wall. At Portman Square Artangel’s front of house opened the door; I showed my I.D., took the painting and left. Back along Oxford Street my arm began to ache, “The Commuters” is painted on board and has a wide deep frame around it, just too big for me to comfortably get a good grip on, so that the ends of my fingers were clasping the rim, I tried turning the picture round the other way, to grip the ridge around the back of the frame, but it was too narrow to get a good purchase on, either front to me or back to me “The commuters” was uncomfortable and I wondered how long Francis Alys’s arms must be. i was wondering how was the process to select the people who would take the painting home. DO you know anything about it? Or do you have Marycalare’s contact? I’d like to know more about her action. The project is an interesting one. So the what was the painting ? about. En guzel bayanlar burada hemen hazir Antalya da.